During the operation of power system it is often desirable and necessary to switch on or off the various circuits i.e. transmission lines, distributors, generating plants etc under both normal and abnormal conditions. Earlier switch or fuse is used for this purpose. But they have two disadvantages. Firstly a fuse blows out it takes quite sometime to replace it and secondly it cannot handle heavy fault currents that result from faults on modern high voltage and large capacity circuits. Due to these disadvantages they are limited to low voltage and small capacity circuits. With the advancement of power system ,the lines and other equipment operate at very high voltages and carry large currents. As switches and fuses cannot handle there is a necessity to employ a more dependable means of control which is obtained by the use of circuit breaker. A circuit breaker can make or break a circuit either manually or automatically under all conditions like no load, full load and short circuit conditions. This characteristic of circuit breaker made it very useful equipment for switching and protection of various parts of power system. A circuit breaker consists of fixed and moving contacts which are touching each other under normal conditions i.e, when circuit breaker is closed. Whenever a fault occurs, the trip coils get energized, the moving contacts are pulled by some mechanism and therefore, the circuit breaker is opened and the circuit is broken. Providing insulation between the contacts and from each contact to earth. Increasing the arc length: The resistance of the arc is directly proportional to its length. The length of the arc is increased by increasing the gap between the contacts. Reducing the arc arc x-section: If the area of the X-section of the arc is reduced, the voltage necessary to maintain the arc is reduced. Splitting the arc: The resistance of the arc can be increased by splitting the arc into number of smaller arcs in series. Each one of these arcs experiences the effect of lengthening and cooling. The arc may be split by introducing some conducting plates between the contacts. Cooling the arc: Cooling helps in the de-ionisation of the medium between the contacts. Cooling increases the arc resistance. Efficient cooling may be obtained by a gas blast directed along the arc. In this method of arc extinction, the arc resistance is kept low until the current is zero where the arc extinguishes naturally and is prevented from restriking after it has gone out at a current zero. This method is used in all modern high power ac circuit breakers. Rate recovery theory is also known as Slepian's theory. The rate at which the ions and electrons recombine to form, or are replaced by neutral molecules. i.e the rate at which the gap recovers its dielectric strength, is compared with the rate at which the restriking voltage across the contacts rises. The arc persists if the restriking voltage rises more rapidly than the dielectric strength. Energy balance theory is also known as cassie's theory. Immediately after the current zero the contact space contains ionised gas therefore has a finite post-zero resistance. The rising restriking voltage causes a current to flow between the contacts so that power is dissipated in the contact space. Initially when the restriking voltage is zero and it is again zero when the space has become fully de-ionised and the resistance is infinitely high between these two limits the power dissipated rises to maximum. If the heat so generated exceed the rate at which heat can be dissipated from the contact space, ionisation will persist and breakdown will occur, giving an arc for another half cycle. 1. Causing the ionised particles in the space between contacts to recombine into neutral molecules. 2. Sweeping the ionised particles away and replacing them by un-ionised particles. High pressure: If the pressure of the arc is increased, the density of the particles also increases. Increased density causes higher rate of de-ionisation and increase in the dielectric strength of the medium between the contacts. Cooling: Dielectric strength of the medium between the contacts can be increased by cooling the arc. Lengthening of the gap: Dielectric strength is proportional to the length of the arc. Therefore, by opening the contacts rapidly, higher dielectric strength of the medium is achieved. Blast effect: The dielectric strength can be increased if the ionised particles between the contacts are swept away and replaced by un-ionised particles. Blast effect can be achieved by a gas blast directed along the discharge or by forcing oil into the contact space. As soon as the contacts separate out an arc is formed. The voltage across the contacts during the arcing period is known as Arc voltage. Arc voltage is relatively low with heavy current arcs of short length. At current zero arc voltage rises rapidly to the peak value since a short circuit current is almost 90° lagging. The transient voltage appearing across the contacts at current zero during arc period is called the restriking voltage. Restriking voltage will probably restrike the arc so that it persists for another half cycle. At current zero, a high-frequency transient voltage appears across the contacts and is caused by the rapid distribution of energy between the magnetic and electric fields. This transient voltage is known as restriking voltage. The current interruption in the circuit depends upon this voltage. If the striking voltage rises more rapidly than the dielectric strength of the medium between the contacts, the arc will persist for another half-cycle. On the other hand, if the dielectric strength of the medium builds up more rapidly than the restriking voltage, the arc fails to restrike and the current will be interrupted. 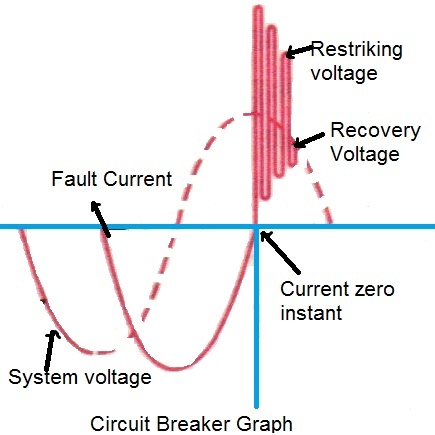 Recovery voltage is defined as the normal frequency rms voltage that appears across the circuit breaker contacts after final arc extinction has occured. Now we can say that if RRRV is smaller than the rate at which the dielectric strength between the contacts is developed, the arc will be quenched, otherwise it will further restrike in next half cycle. This theory is called the recovery rate theory. when a circuit breaker interrupts a low inductive current, current falls to zero before the natural current zero. It is termed as current chopping. It happens because the circuit breaker exerts the same force of arc quenching as it were with heavy short-circuit current.